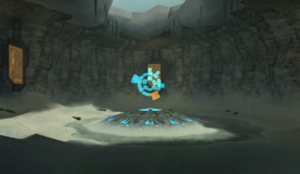 The Storage Cave is a room in the Phendrana Drifts. The room is accessed from a hidden Red Door in Phendrana's Edge. The Artifact of Spirit can be found in the center of the room. A number of panels are on the wall that display various Space Pirate data. This page was last edited on 18 July 2013, at 04:04.